No snow? Doesn’t mean we can’t sled! Siberian huskies are possibly one of the most misunderstood breeds of dogs in South Africa. Owners often go out and get a puppy because they are so incredibly beautiful. The blue eyes and fluffy coats do make this breed simply irresistible. What many new owners don’t realize is that these dogs need a lot of exercise and constant stimulation. Siberians are working dogs. It’s what they love to do. With this in mind a group of husky and other working dog owners gather during the winter months of the year and participate in Dryland Sledding with their dogs. You don’t need to be incredibly fit to sled. You just need a keen sense of adventure and a passion for your dogs and you’ll be hooked on this sport! There are various disciplines in Dryland Sledding, it really does depend on your personal preference and the number of dogs you have. 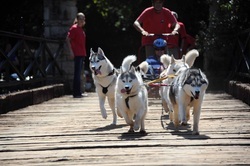 One or two dogs can be connected to a bike or a scooter and the musher (rider) can ride behind the dogs around the track. For those who prefer to keep their feet firmly on the ground, there is a discipline called canni-crossing where the dog’s lead is attached to the musher’s waist and the dog runs around the track in front of the musher. And then for the more experienced mushers there is carting where a number of dogs (four – eight) are connected to a cart. This requires a little more skill as the musher needs to be able to read body language and lead the pack around the track. There is special equipment available for the different disciplines. It is important that dog owners use the right equipment. The safety of the dogs always comes first. - Dryland sledding is a fantastic way to bond with your dog!